The Maldives government is determined to protect the marine life around its shores - and along with it, the country's economy. I stare into the eye of the manta ray as it cruises past me - just centimetres from my face - on great black wings, three metres wide. Behind it there is another manta, and another and another, forming an orderly queue as they open their mouths wide to scoop up the tiny black specks of plankton on which they feed. I am soon surrounded by more than 40 of these flat but graceful creatures, swooping and soaring through the water as gracefully as any bird on the wing. From above, they are like black shadows but, from below, it is as if I can see their working parts. Vast white bellies covered in spots, rippling gills like silk curtains and those curious mouths located right at the front of the head, into which I can peer like Jonah about to descend into the jaws of the whale. But these are peaceful giants going about their business, seemingly unafraid of me and the other divers who get in their way. 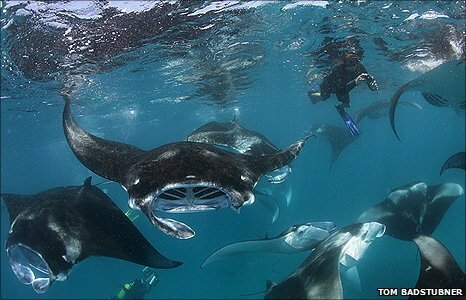 Above water, I watch from the diving boat as the manta rays congregate in the shallows inside the reef. Standing on the prow is Guy Stevens, a British marine biologist who has studied the mantas at Hanifaru for several years. "They come into the bay at high tide," he explains. "And sometimes there can be 200 rays in this one spot which is only the size of a football pitch." The challenge for Stevens is that local hotels and the so-called "safari boats" that carry scuba divers around the Maldives have also discovered the secret of Hanifaru. "The government has declared the bay a protected area," says Stevens, "but we need a patrol boat or a ranger to monitor just how many people can swim with the mantas at any one time. "Sometimes the rays have to compete with 100 swimmers and divers crowded in here." The government has declared manta rays off limits to fishermen, along with sharks. But elsewhere in the Indian Ocean, both mantas and sharks are being increasingly targeted because they are valued either as food or as ingredients in Chinese medicine. The manta's life cycle is more like that of a mammal than a fish. They do not reproduce until they are about 15 years old, and produce only one baby a year at most. Guy Stevens tells me that manta rays have the largest brains in relation to their body-size of any fish. There are even several documented cases of them seeking out human contact to help them disentangle themselves from nets or fishing lines which cut into their flesh and cause serious injury. Protecting the rays of Hanifaru is just one of the underwater challenges facing the Maldives government. Corals in the Maldives and virtually everywhere in the tropics face a terminal decline, damaged by rising sea temperatures and pressure from man-made development. At the Four Seasons resort not far from Hanifaru, an experiment is taking place to transplant fragments of broken corals to create an artificial reef. When I visited the resort, there was a VIP visitor snorkelling above the new reef: President Mohamed Nasheed, accompanied by his wife and two young children. A few European and Japanese tourists watched with bemusement as the president of the Maldives and his family emerged from the water surrounded by security officers and advisers. Still dripping wet and wearing his swimsuit, the president shook my hand and we sat close to the beach, sipping ginger tea as we discussed the marine environment. "Growing coral like this may be the future for protecting our shoreline from the sea - a kind of bio-engineering more effective than concrete and steel barriers," said Nasheed. "The marine world is a beautiful attraction for tourists, but remember it's where almost all of our food comes from. "Tourism and scuba diving are just the latest ways in which the reefs and the ocean have sustained our islands." "Our lives," he mused, "depend upon a healthy relationship with the Indian Ocean." 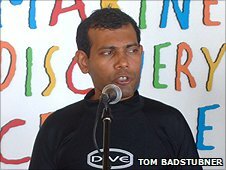 In 2009, President Nasheed attracted media attention from around the world by getting his cabinet to sign a declaration on climate change. What was unusual was that the cabinet convened underwater - wearing scuba gear. With nowhere in the Maldives more than 2m (6.5ft) above sea-level, the threat from climate change is very real. Nasheed's decision to protect the manta rays of Hanifaru is also a matter of economics. It is calculated that tourism to see the schooling mantas in this one bay alone is worth more than $500,000 (£312,000) a year. These friendly, giant fish are a valuable asset. For now, they are safe - if a little crowded - and they will be safer still if funding can be found for that patrol boat at Hanifaru. Can India keep tolerating graft?